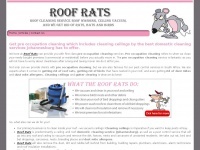 We here at Roof Rats can provide you with first class pre occupation cleaning services. The websites creator or author is SI Works Internet Solutions. Copyright Ipcoweb 2007 is the owner of the copyright for this website. The web server with the IP-address 41.72.138.132 used by Cleaning-services-johannesburg.co.za is run by Hetzner CC and is located in South Africa. There are many websites run by this web server. The operator uses this server for many hosting clients. In total there are at least 109 websites on this server. The language of these websites is mostly english. The websites of Cleaning-services-johannesburg.co.za are served by a Apache web server using the operating system Fedora (Linux). The software used to serve the webpages was created by using the programming language PHP. XHTML 1.0 Transitional is used as markup language on the webpages. Indexing the data of the website and following hyperlinks on it is explicitly allowed by robot information.